ArtsEmerson Presents Daniel Beaty’s "Emergency"
The third season at ArtsEmerson: The World On Stage continues with Daniel Beaty’s "Emergency," playing March 22 -24 at The Cutler Majestic Theatre, 219 Tremont Street in Boston’s Theatre District. Beaty (below) portrays a cast of more than 25 characters in this explosive and funny tour-de-force featuring slam poetry, multi-character transformation and song. Beaty teases out his tale with the colorful commentary of neighbors and bystanders. Juxtaposed against the powerful poetry of the contestants, the responses to this surreal happening and varied testimonies on identity and personal freedom weave a stirring commentary on what it is to be human and the longing to be free. Beaty is an award-winning actor, singer, writer and composer. He has received Lucille Lortel, Drama Desk, Drama League and Outer Critics Circle nominations, the 2010 AUDELCO Award for Outstanding Solo Performance and the 2010 Ovation Award for Best Male Lead Actor. 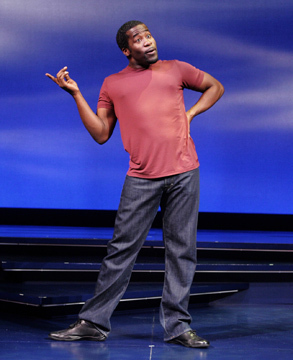 He received the 2007 OBIE Award for Excellence in Off-Broadway Theater for Writing & Performing and the 2007 AUDELCO Award for Solo Performance for "Emergency." He is the recipient of the 2007 Scotsman Fringe First Award for the best new writer at the Edinburgh Festival. This presentation of Beaty’s signature work on the stage of the Majestic will be the culminating celebration of a year-long residency that supports the continued life of four of his plays, puts Beaty in the classroom with Emerson College students, creates open rehearsal opportunities for students and ArtsEmerson members, and brings Beaty’s work to communities around the city. For tickets and information, stop by the box office, call 617-824-8400 or visit www.artsemerson.org.